Silverthorne resident Chris Corning lands on his snowboard in the Hella Big Air competition Saturday, March 3, at Copper Mountain. Corning won the competition, his first contest since the Pyeongchang Olympics. COPPER MOUNTAIN — Back on familiar terrain at Copper Mountain Resort, Chris Corning coasted to victory at Saturday’s Hella Big Air competition, his first contest since taking fourth place last week at the Pyeongchang Olympics big air competition. Under bluebird skies on a very warm afternoon, Corning, a former Aspen Valley Ski and Snowboard Club athlete originally from Denver, looked fully healthy and composed on the same Copper Mountain jump where he badly injured his hips and lower back on a final practice run at the December U.S. Grand Prix Olympic qualifying event. Two-and-a-half months ago at that event, Corning gutted through the sudden pain to make the podium and kick-start his eventual Olympic qualification in slopestyle and big air. Back at Copper on Saturday, Corning landed his most difficult trick of the day, a backside triple cork 1440 (three inversions, four rotations), to earn a score of 94. It put Corning in first-place position heading into the second run, where he landed a frontside 1080 with a lien grab (three rotations while grabbing his heel edge with his front hand), a trick that earned him an 83. The combined score put Corning in first-place position heading into a final run when he would be the last competitor to drop in. And when he did drop in, Corning already had the Hella Big Air victory in hand, so he opted to repeat his frontside 1080 instead of going for the frontside 1440 he would have attempted if he wasn’t in first place. With the win, Corning took home the Hella Big Air snowboarding first-place purse of $10,000. It’s a prize he said he’d use for summertime fun with his father, Brook. Corning described the competition as a warm homecoming of sorts after the Olympic competition dished out what he described as some of the coldest temperatures and wind chills he’s experienced. In the wake of the Olympics, Corning added that he and Never Summer plan to raffle off, at the Never Summer Welcome Home Party down near Denver, either, one of the two spray-painted American-themed helmets he wore at the Olympics, or his Olympic board. He added that the welcome party venue and date still is to be determined. Corning also will compete at this week’s Burton U.S. Open at Vail Resort, an elite-level international competition at which he took fifth place last year. After, he plans to compete at International Snowboarding Federation World Cup events in Europe as he has his sights set on this year’s snowboard slopestyle title. 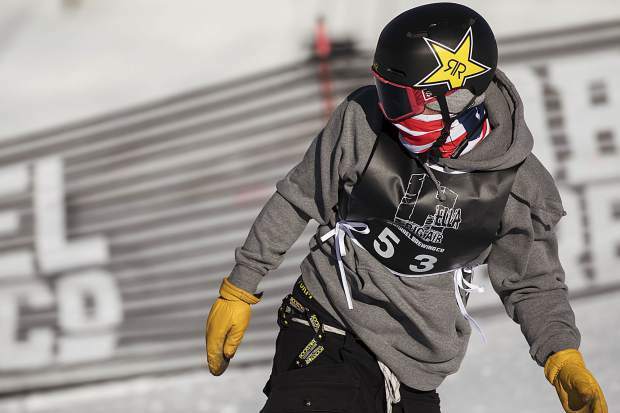 “The course is always super creative and it’s always pushing the sport in a new way,” Corning said of the Burton Open, at which his Olympic teammates and fellow Summit County residents Red Gerard and Kyle Mack are also schedule to compete. Neither competed at the Hella Big Air event. As for his epic attempt at a backside quad cork 1800 (four inversions, five rotations) at last week’s Olympic big air event, Corning said his decision to try the trick was actually a last-minute decision. The 18-year-old said the attempt at the landmark trick, essentially, came down to whether the sun was peeping through the clouds or not at the Alpensia Ski Jumping Centre. “It was actually really flat light, so I wasn’t going to do it,” he said. “It was so last minute at the top, dropping in. I asked my coaches, ‘Should I go front 18(00) or back 18(00)?’ The sun came out and we decided, strapped in and everything, that I was going to go back 18(00). “I didn’t have a whole lot of time to pump myself up to try it,” Corning continued, “so I had to do it all super quick, just ’cause the sun decided to kick out a little bit. So it’s like, ‘alright,’ because I wasn’t going to do it if it was dark. So, you know, it was kind of a split-second decision, we are going to go for it and see what happens. I wanted to do well. He did try it. And the attempt, though he didn’t land it, was nothing short of fearless on an Olympic jump that didn’t exactly lend itself to the trick that, if it was landed, would have been a first-ever for the sport in-competition. “They were about the same length,” Corning said of the Olympic jump versus the Mammoth Mountain jump where he previously landed the trick, not in competition.